Radiant Bride by Larry Alice. 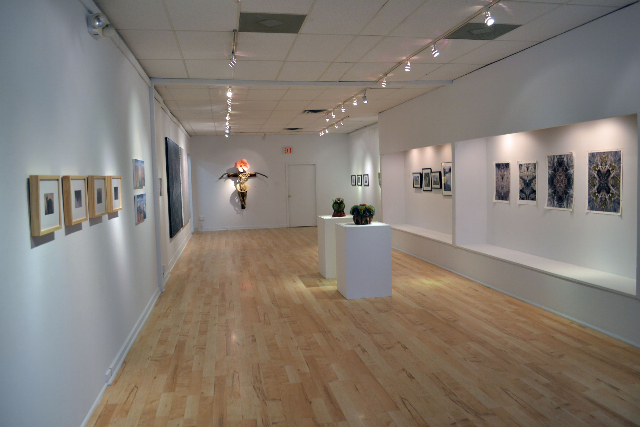 Installation view of Gallery 51 in North Adams. Strange Flower by Jennifer Maestre. 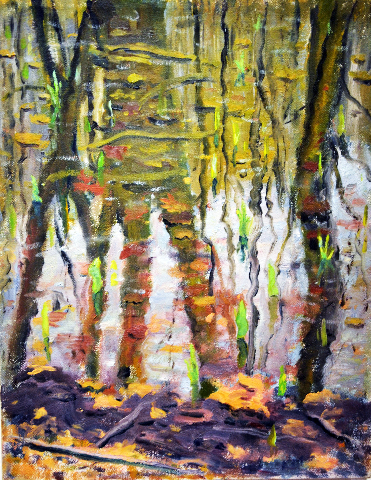 Kevin McLatchy, Vernal Pool with New Growth. Broad Brook by Joanna Gabler. In the show Biotope, at Gallery 51 in North Adams, the viewer is given the chance to experience life from the perspective of other life forms: animals, landscape, and vast fields denoting the pattern and apparent chaos in nature. Biotope refers to “habitat –an area within a biome where smaller subdivisions of species live,” suggesting a search for the “spirit of place” mentioned in the show’s introduction. Poet Gary Snyder writes that “wildness is the state of complete awareness.” This web of awareness in nature often strains our intellectual understanding, reaching towards something larger and more inclusive. In this show the mysterious depth of nature and its awareness, looking out at us and through us, seems to overshadow the projection of personality often present in art. …a steady flow of energy from the inexhaustible source of the sun to the unfillable sink of outer space, by way of the earth, is mathematically destined to cause the organization of matter into an increasingly ordered state. The resulting balancing act involves the ceaseless clustering of bonded atoms into molecules of higher and higher complexity and the emergence of cycles for the storage and release of energy…….the solar energy would not just flow to the earth and radiate away; it’s thermodynamically inevitable that it must rearrange matter into symmetry, away from probability, against entropy, lifting it so to speak into a constantly changing condition of rearrangement and molecular ornamentation. It’s not a coincidence that so many of the pieces in the show tend toward symmetry of some kind, as if Lewis’s statement plays out in the vision of these artists. 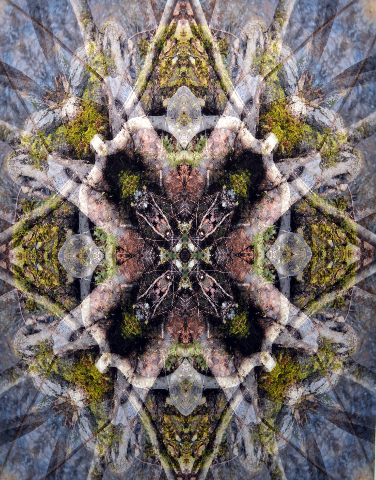 Joanna Gabler’s kaleidoscopic photographically collaged images of nature seem to increase the speed of reality into the whirring of bird wings or an elusive spirit of an animal or an archetype – whose forms radiate out from the center. The image suggests a kind of epiphany she calls “nature transfigured.” Imagery goes beyond the choice of natural forms in her photograph “Broad Brook” (although limbs of trees and feathers are discernable) into a newly invented, ‘felt’ reality of transformation. In Kevn McLatchy’s small oil canvases individual units of place make up an all-over pattern. 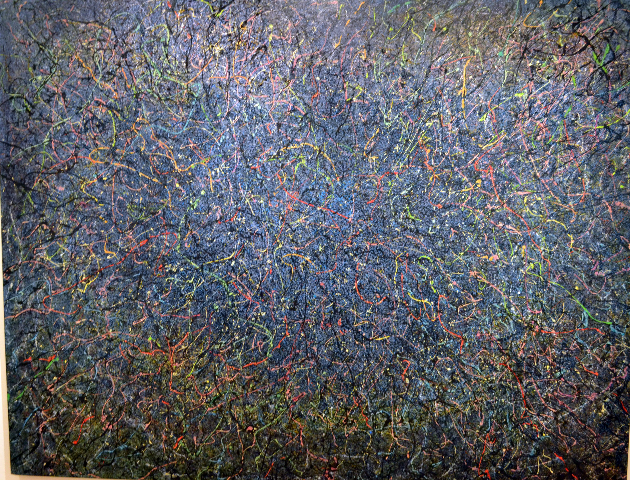 “Vernal Pool with new Growth” resonates as actual nature, while creating a kind of vibrating whole. Michael Miller’s fine grained photographic vision of Irish landscape invests natural scenes with the mood of previous ancient inhabitants, as the moss-encrusted ring of stones in Grange Stone Circle Lough Gur, Co. Limerick, exhibiting ancient symmetry, links form to centuries of spiritual belief. In Pond, Glenstal Abbey, Co. Limerick 2, water’s surface is covered with a profusion of life of all kinds, building upon itself in ever-widening pattern. Rick Harlow’s large abstract canvases go even farther, into pulsating depths that register as the experience of nature or creation, or what one might feel or see leaning into the smallest, most amazing section or a leaf or flower. In a departure from his earlier work, no visual hint of landscape remains in Aluna, which refers to the native Columbian mythic concept of the source of thought; it could be an enlargement of a fragment of an earlier painting. At his invitation the viewer has become nature, or the cosmic principle, and is one with the whirling chaos of what lies within it. 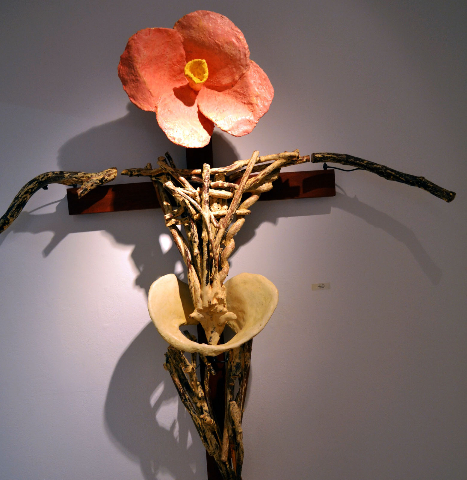 In contrast, Larry Alice’s sculpture, Radiant Bride, is like a forced marriage of two stages of growth. The bone-like vertical forms that mirror a human skeleton resolve into a vast flower at the top of the figure. The end of a process (death, bones) is united with the ultimate expression of a plant organism, when it would spread its seeds or pollen for propagation from a flower or a stem. Maybe the bringing together of opposite poles of life offers resolution of the trials life forms encounter. His title suggests the ultimate expression that comes from sacrifice, with a touch of sarcasm and wry humor. 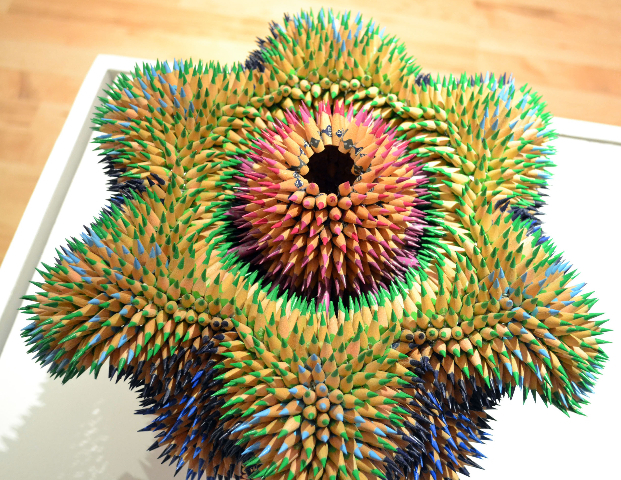 Jennifer Maestre’s pencil sculptures cleverly play with radially symmetric organic form made with brand new colored pencils, sharpened and repeated endlessly, creating tension between the individual mark or pencil, and the larger whole. Strange Flower suggests nature’s repetition, where one aspect of a form replicates itself over and over in a relentless way, even at times with poisonous intent, and apparently unstoppable by human means. Two artists in the show photograph animals in a very a-typical, yet still figurative way. Here is a good example of detachment characteristic of the show in general. In Greg Scheckler’s softened, out-of-focus photoworks, the viewer feels or sees as if from within the softened animal forms coming out of the woods, out of hiding, obscured, photographed with a hidden camera. 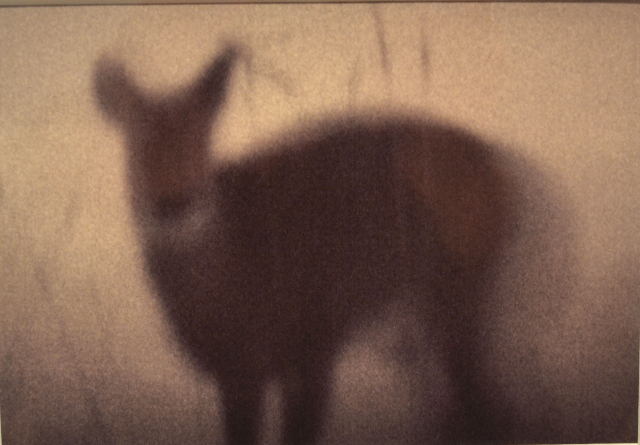 Deer, Bear and Fox move like shadows across the field of vision. Ron Morris’s photographs, too, emphasize the feeling of the animals themselves, awkwardly situated in a vast landscape. In Texas Longhorn the steer looks away from the camera, aloof and unconcerned, while in Cow, Valley, Arizona the animal is dwarfed by space, literally made a tiny point in a large field. The tone is not bright and specific but grainy and dim, perhaps attempting to capture the way animals experience their surroundings. 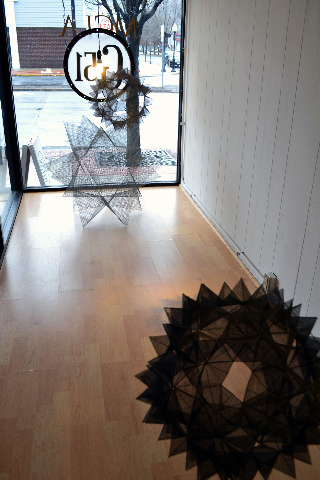 Richard Harrington’s sculptural pieces, made from wire aluminum screening, seamed delicately together to form geometric entities, inhabit the long glass window case as one enters Gallery 51. Larger than his usual pieces, they sit and hang quietly in space, contemplative of forms existing at the molecular level. They satisfy some meditative need to see perfect form, made of humble material, mysterious, even platonic. Along with Harrington’s sculpture is a precise drawing illustrating cell growth in a fine-lined print using Adobe Illustrator, further exploring the question of how form is made, and made visible, like a rosetta stone of the universe. The show, at 51 Main St., North Adams, MA, has been extended to April 16, 2017. "Thank you Sarah for your thoughtful review. Nice work!"